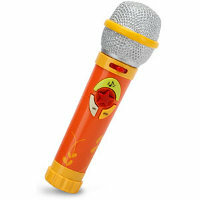 Love all things karaoke and have that interest rubbed off on your little ones? You might want to consider the Okideoke Karaoke Microphone seeing action in your home then – or should we say, hearing action? Retailing for $21.99 a pop, the Okideoke Karaoke Microphone is colorful enough to attract a kid’s attention, where it will go about amplifying your little one’s voice. Of course, some parents might think that this is a crazy idea since their bundle of joy is able to outshout Banshee of X-Men fame. Good thing there is a purpose to this – it comes with eight prerecorded classic children’s tunes to sing along with and the ability to record the performance for parental review later on. Nice to know it is ready to work right out of the box since it will come with a trio of AAA batteries to get you started straight away. Neighbors, be forewarned!